DORIS ROWLETT JENKINS (March 4, 1922 to November 17, 2013) — Some memories of a wonderful life. DORIS ROWLETT JENKINS, 91, passed away Sunday morning at 7:30 a.m. at Our Lady of the Lake Hospital, where she was recuperating from a heart attack. She was born March 4, 1922, in Houston, Texas, and died November 17, 2013, in Baton Rouge. She was a loving mother, grandmother, great-grandmother, and friend to many. She is survived by her son, former Rep. Louis E. "Woody" Jenkins, Jr., and his wife Diane Aker Jenkins; grandchildren Margaret Jenkins Savoye and her husband Darren of Jefferson, LA; Elizabeth Ann Jenkins of Denver, CO; David Aker Jenkins of Baton Rouge, and Catherine Ann Jenkins of Baton Rouge; great-grandchildren Gabrielle, Louis Joseph, and James Sawyer Savoye of Jefferson, LA; and nephews and nieces Gordon and Jan Jenkins; Edward, Randall, and Mark Rowlett, and Anita Rowlett Hopkins. She was preceded in death by her parents Frederick Putnam Rowlett and Beatrice Eernisse Rowlett of Houston, Texas; her brother, Walter Rowlett, of Houston and her husband, Louis E. "Ory" Jenkins, Sr., of Ponchatoula and Baton Rouge. Doris grew up in Alvin and Shreveport. She attended Byrd High School and graduated from Alvin High School in 1940. During World War II, she met a handsome sailor who was recovering from war injuries at the Galveston Naval Hospital. They fell in love and married in 1946. They resided in Ponchatoula where they owned a restaurant, Little Ory's Den, before moving to Houston and then Baton Rouge. Ory was an operator at Ethyl Corporation, and Doris worked in safety deposit at American Bank on Plank Road. She retired from the bank in 1982 after 25 years' service. She was affectionately known as "G" by her grandchildren and their friends at Parkview. As a child, she had red hair and was known by the nickname "Pinky". She loved to wear a red hat and a red cap, which was perfect when she played Mrs. Santa Claus for children in her later years. She has written an autobiography, which will be published on-line in the spring of 2014 by Community Press. It is a humorous collection of her writings from the 1920's to the present. She has lived with her son Woody and daughter-in-law Diane for the past 27 years, and they cared for her during the many health problems she has endured for the past 15 years. Despite those, she maintained a clear mind and humorous wit until this weekend. She was recovering from a heart attack and doing well Saturday, but her condition declined early Sunday, and she passed away. Friends and acquaintances are invited to visitation Tuesday from 6-8 p.m. at Resthaven Funeral Home, 11817 Jefferson Hwy., Baton Rouge, and again Wednesday at 10 a.m. Services will be conducted by Lt. Arron Mcguffee, Chaplain, USN, at 11 a.m. at the Resthaven cemetery. 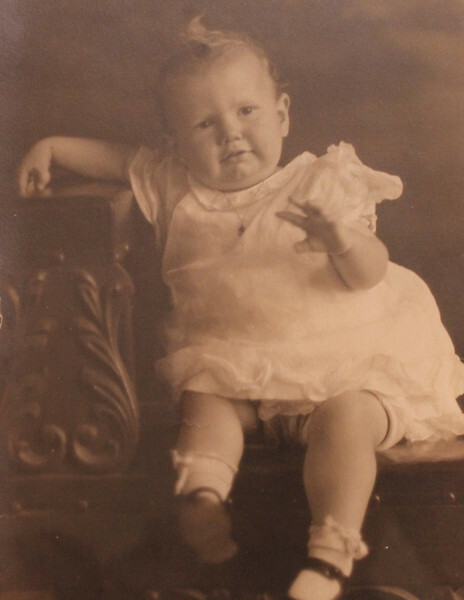 Doris Laverne Rowlett, born to Frederick Putnam Rowlett and Ester Beatrice Eernissee at home in Houston, Texas, on March 4, 1922. In this photo, she is about two.